Rounding off New York Fashion Week with some much-needed razzle dazzle (honestly, it’s been all grunge and minimalism so far) Marc Jacobs reminded us all last night that he is one of fashion’s ultimate showmen. He hired a theatre, a bundle of supermodels and one massive popcorn making machine to present his collection, a circus of Americana colour and the best new season party dresses we’ve seen so far. Emily Ratajkowski hit the catwalk for the first time ever, and the crowd went wild for the Blurred Lines veteran turned IT-girl of the moment. In a nautical-meets-ringmaster styled ensemble, she fit straight in with Marc’s supermodel line-up. 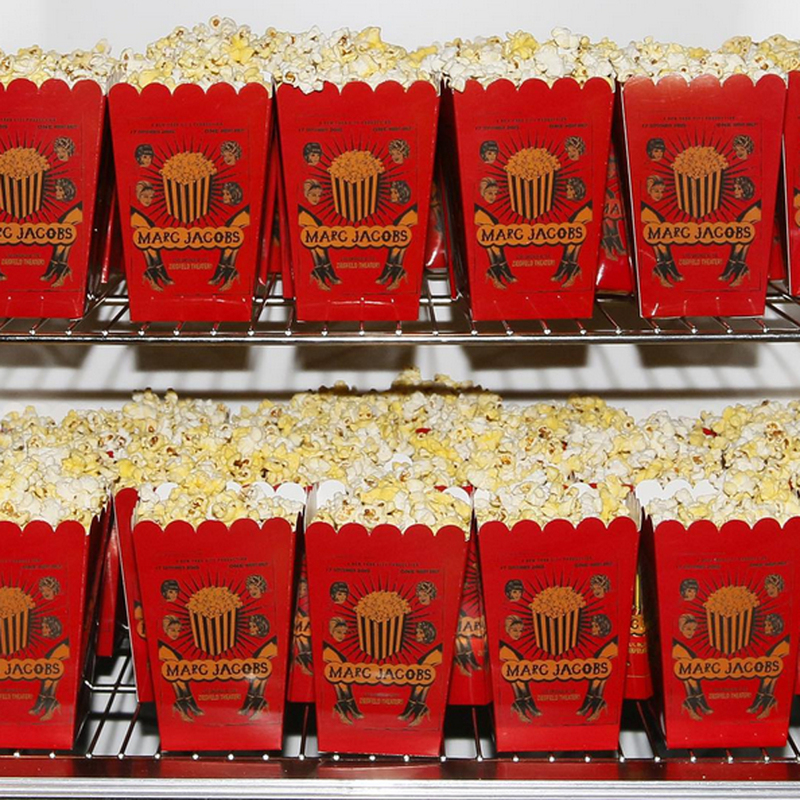 Kendall Jenner, Beth Ditto, Adriana Lima, Joan Smalls, Bella Hadid and Karen Elson all walked in the show, while everyone from Winona Ryder and Bette Midler to Sofia Coppola chomped on MJ popcorn in the audience. 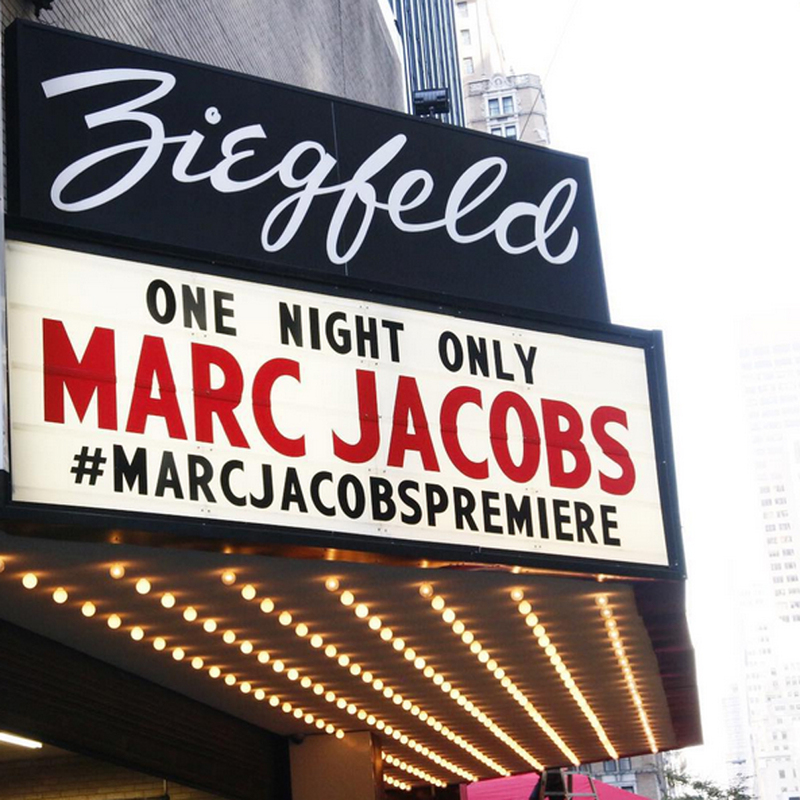 For the first time in years Marc chose to show his collection somewhere other than the Park Avenue Armoury, renting out New York’s iconic Ziegfeld Theatre for his background. As a big band played on the stage, models walked in via a premiere-style red carpet, before coming down the aisles and through the audience. Every look was heavily (but beautifully) embellished, either with clusters of sequins and jewels on shoulders, or rich embroideries positioned perfectly to define and flatter around the waist and bust. A full skirt was repeat-printed with Janet Leigh’s iconic expression from Psycho and on other, less literal, interpretations, the silver screen icons were made over in painterly strokes. This was vintage movie star get-up with a thoroughly modern twist, ready and waiting for today’s stars to parade on the red carpet.